* All demonstrations must be set by 4:00 PM. The Service Manual will be sent via e-mail the week of May 6, 2019, to the official contact for each demonstrating company. The Service Manual will only be sent to those companies who have paid in full by March 22, 2019 for their tabletop space. Companies with a demo table at the TVT 2019 are entitled to two (2) complimentary full conference badges per tabletop. 2. Enter Promo Code: Code will be emailed separately in Welcome Letter. 3. Enter Contact Information for your complimentary staff. 4. Repeat above steps for second complimentary full conference badge. Additional badges may be purchased online. Complete Terms and Conditions are available online. 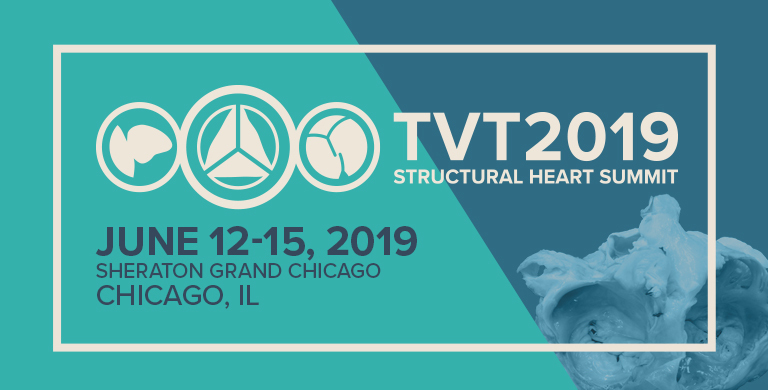 For registered participants who require housing, the Cardiovascular Research Foundation (CRF) has reserved a block of rooms at a special group rate at the Sheraton Grand Chicago located at 301 E North Water St, Chicago, IL 60611. Housing reservations must be made by Wednesday, May 29, 2019; thereafter, hotel accommodations and preferred group rates will be subject to availability. Room cancellations must be made in accordance with the hotel cancellation policy of 72 hours prior to the date of scheduled arrival or your credit card will be charged for a one-night stay and applicable taxes and fees. All exhibiting companies at TVT 2019 must adhere to the terms and conditions outlined below. While the Cardiovascular Research Foundation makes every effort to promote and encourage attendees to visit the demonstration area, attendee traffic cannot be guaranteed. It is the demonstrating company’s responsibility to promote its presence at the meeting to draw traffic to their booth. The preregistration list will be made available two weeks prior to the meeting to all exhibiting companies for a promotional mailing. Demonstrating companies must follow OSHA guidelines for disposal of hazardous waste. In accordance with Cardiovascular Research Foundation policies, product information cannot be distributed at scientific sessions or in hotel lobbies. Posters or tabletop exhibits are not permitted immediately outside or inside the general session. Demonstrating companies may not demonstrate products and services, solicit orders, or distribute advertising material at any location (within or outside the Exhibit Hall) other than within their assigned tabletop. The tabletop may be subject to forfeit if this guideline is violated. Cancellation on or before March 22, 2019, the demonstrating company will pay 50% of the exhibit fee. Cancellation after March 22, 2019, the demonstrating company will pay 100% of the exhibit fee. Demonstration companies must install and break down their tabletop space during the designated installation and dismantle times. If a demonstration company does not comply with these times, the Cardiovascular Research Foundation reserves the right to delay the demonstration company’s set-up until deemed appropriate and will impose a financial penalty of $1,000.00. The Cardiovascular Research Foundation and Sheraton Grand Hotel are not responsible for theft of or damage to exhibitor property. Demonstration companies wishing to insure their tabletop materials, goods, or wares against theft, damage by fire, accident, or loss of any kind must do so at their own expense. Demonstration companies are responsible for obtaining general liability insurance coverage against injury to persons and property in commercially reasonable amounts and to designate the Cardiovascular Research Foundation as additional named insured. Detailed information regarding work rules for all trades operating at Sheraton Grand Hotel will be provided in the Service Manual. Sales and order taking are permitted provided all transactions are conducted in a manner consistent with the professional nature of the meeting. Products for sale must be the demonstration company’s own unaltered products, and the products or services must be pertinent to the attendees’ professional interest. The Cardiovascular Research Foundation reserves the right to restrict sales activities that it deems inappropriate or unprofessional. Demonstration companies must comply with all sales tax requirements. Demonstration companies selling or taking orders during the meeting must adhere to all business license and sales and use tax regulations, which vary from state to state. Demonstration companies must make provisions for safeguarding goods, materials, equipment, and displays at all times. The Cardiovascular Research Foundation is not responsible for the loss of any property. Demonstration companies may not permit any other party to tabletop within their space any goods other than those manufactured or distributed by the contracting demonstration companies or permit the solicitation of business by others within its space. The document is a binding contract when signed and submitted to the Cardiovascular Research Foundation and indicates the applicant’s willingness to abide by all contract terms, conditions, and general rules and regulations listed, as well as such additional rules and regulations that the Cardiovascular Research Foundation deems necessary to ensure the success of TVT 2019. These terms and conditions may be amended at any time by the Cardiovascular Research Foundation and all amendments, upon publication, shall be equally binding on all parties affected by them as the original regulations. The signer of the document also agrees to share the terms and conditions with all exhibiting company representatives who attend TVT 2019. In the event that TVT 2019 is abbreviated or canceled because of circumstances beyond the control of the Cardiovascular Research Foundation, including but not limited to: civil disturbance; earthquake; electrical outage; explosion; fire; freight embargo; flood, hurricane, or other acts of God; an act of war; terrorism; or the act of any government (de facto or de jure) or any government agency or official, the Cardiovascular Research Foundation reserves the right, in the Cardiovascular Research Foundation’s sole discretion, to unilaterally terminate the agreement between the Cardiovascular Research Foundation and the exhibitor and/or the license that is granted by virtue of the submission of this booth space contract and its acceptance by the Cardiovascular Research Foundation. In these circumstances, the exhibitor expressly agrees to waive any claim the demonstration companies may have against the Cardiovascular Research Foundation, including but not limited to those for fees paid by or on behalf of the demonstration companies for tabletop space, registration, workshops, satellite events, support opportunities, food and beverage, audiovisual services, signage, housing, and travel.